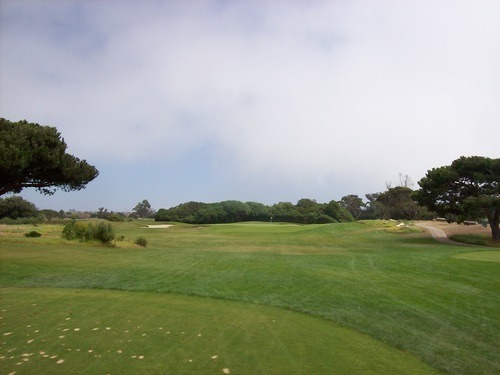 Sunday, I ventured up the coast a little bit for some golf and good times. The LA Golf Group I belong to was having an afternoon outing at Olivas Links in Ventura (the group’s unofficial “home” course). I’ve reviewed that course a few times in the past couple of years, so I won’t spend too much time on it. But I did take some new pictures and will share them later on in the story. 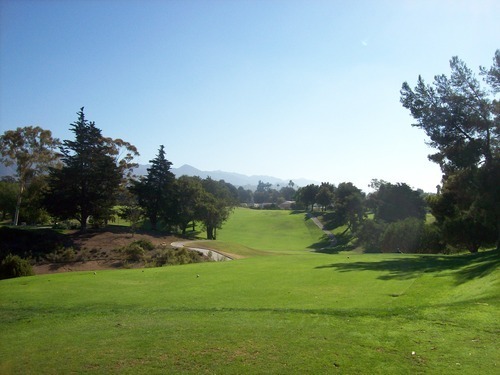 With a number of other high-profile courses throughout the Central Coast, the old Santa Barbara track wasn’t high up on my to-do list, but I knew I’d get there eventually. Sunday proved to be the perfect chance to check it out. I got there before the crack of dawn. 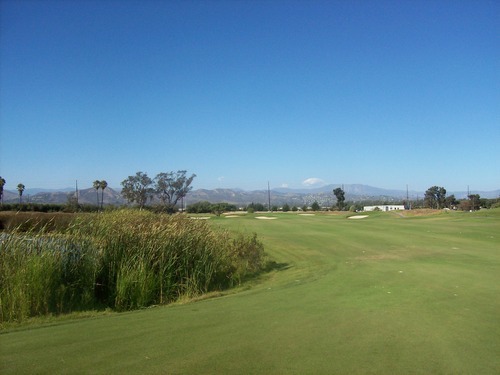 As a single, I wasn’t able to make any reservations here and knew I’d have to check in early in order to play 18 before heading back down toward Ventura. I was the first in line as quite a few guys showed up by the time they opened the doors to the pro shop. I had my worries seeing so many people, but it ultimately worked out. I put my name on the wait list and went outside to the putting green. 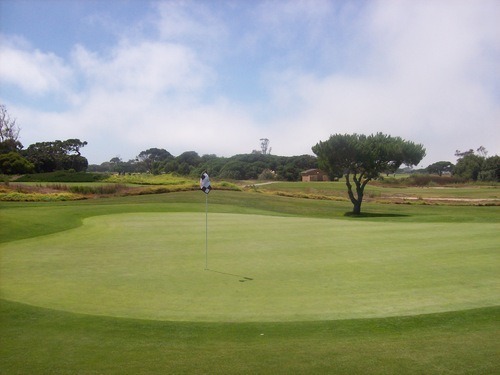 By the time I had rolled one putt, they were already calling my name. Turns out, they had a twosome set to go off first and I would be joining them. Perfect! The unfortunate thing was that I had no choice but to pay the full rack rate. The non-resident rate here with a cart is $75, which is downright ridiculous. They do give nice resident rates and will also throw you a discount if you’re staying at a local hotel. Also, they always have very cheap times on GolfNow, but none of those helped me Sunday and it was a bummer to have to pay the full price. Still, I was happy to get off early. The fog was very heavy at daybreak and that made things tough. It also made getting good pictures of the front nine nearly impossible. 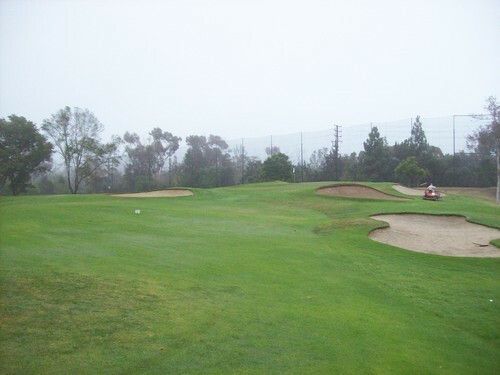 Fortunately, I was playing with two regulars (one of whom is a marshal at this course), so they showed me where to go. We played the front nine quickly, but then ran into a bunch of groups on the back nine. This course gets a lot of early morning back nine play and they let people out until 8:30 apparently, which is way too late if you ask me as it’s sure to cause some traffic jams when making the turn. Though the back nine was slower, we still finished in under four hours, so the timing was ideal for me. 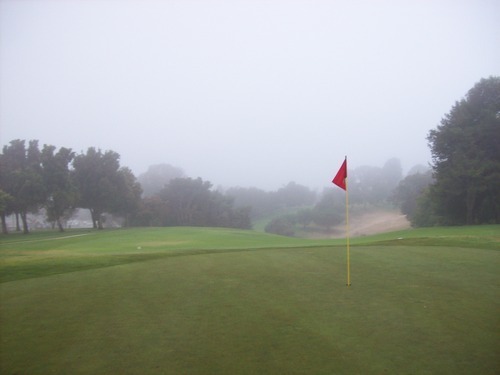 And once the fog started to lift, I was able to get a better view of what is actually a nice looking little course. This place really lights up nicely when the sun comes out! 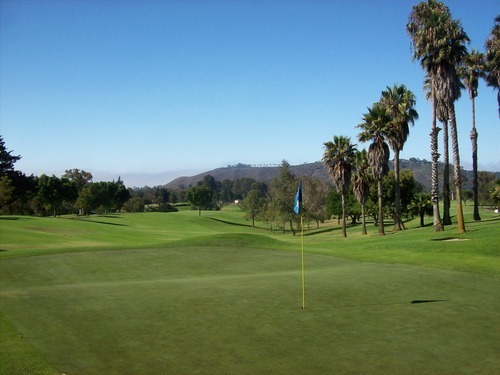 Santa Barbara GC is not far off the freeway, directly behind the Earl Warren Showgrounds. That said, it’s a very nice setting with the mountains in the background and the ocean not too far away. 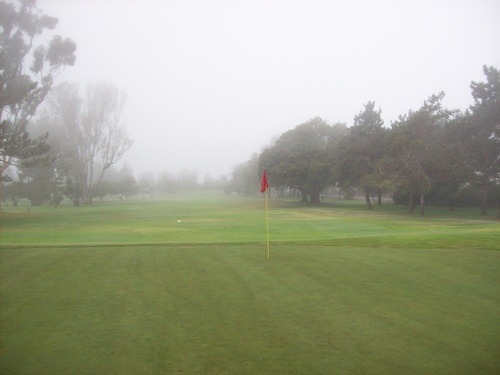 I do believe there are some parts of the course that will provide a little ocean view on a clear day, but I didn’t encounter any Sunday with so much fog early on. 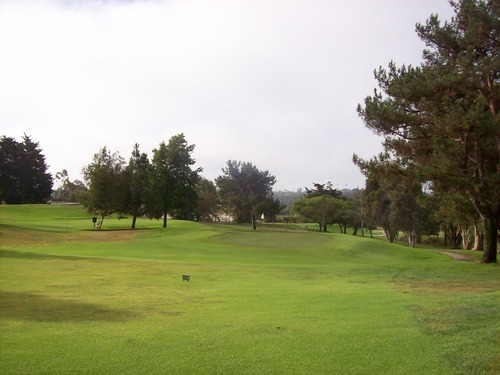 As a par-70 course with an older design (that has apparently been renovated and rerouted several times for various reasons over the years), this course has a fairly short total yardage at just under 5,900 yards from the back blue tees. Don’t let that number fool you, though, because this is no easy little course. The total yardage is skewed by the fact there are only three par-5s that aren’t super long and five par-3s (including one that’s only about 100 yards). There are a handful of long par-4s mixed in, so it’s actually a pretty good mix of hole lengths overall. The terrain here is very hilly and there are not many flat lies on the entire course. You are hitting uphill, downhill and off of awkward side-hill lies all day long. 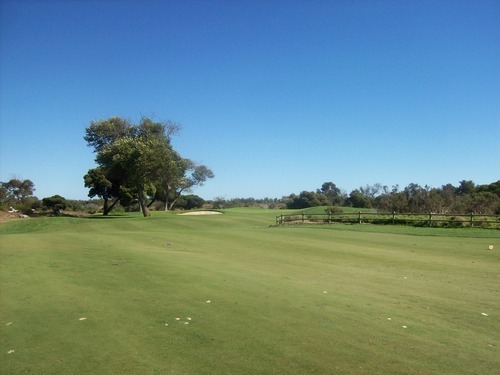 The slanted fairways can kick your ball off course and into the trees. 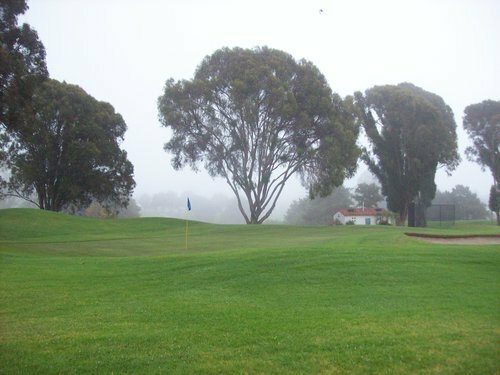 There are plenty of trees throughout the course (though not as many as there used to be, they told me) to make things feel pretty tight from tee to green on many holes. 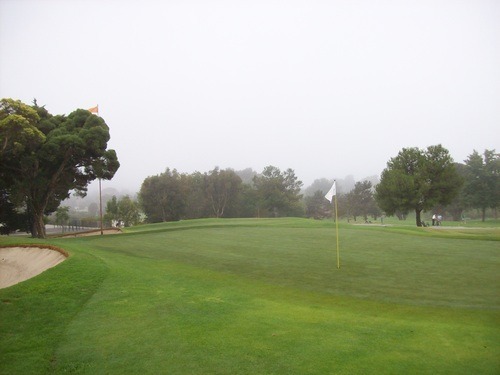 Where Santa Barbara GC has the most bite is on the greens. Most of them here are massive. There is some undulation, and the slopes are pretty severe to make them very difficult to read. Naturally, everything here breaks toward the ocean, so that’s an additional factor to make these difficult greens even more tough. 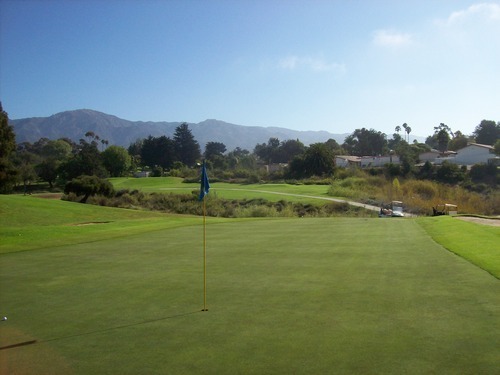 On Sunday, the greens were very firm, as well, so needless to say it was an adventure for me all day! 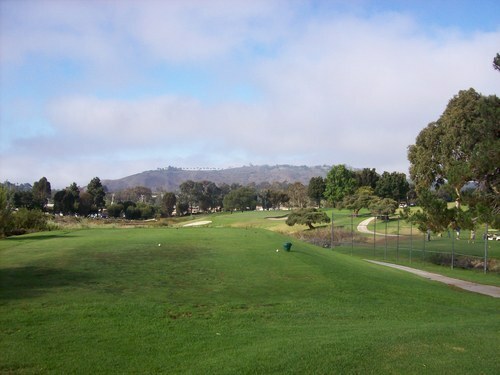 Otherwise, I’d say the course was in pretty decent “muni” shape. 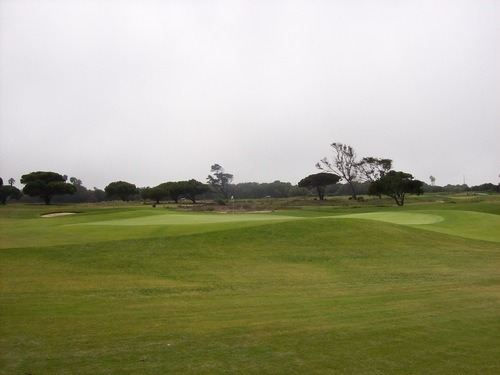 The fairways and rough have typical late summer kikuyu grass. 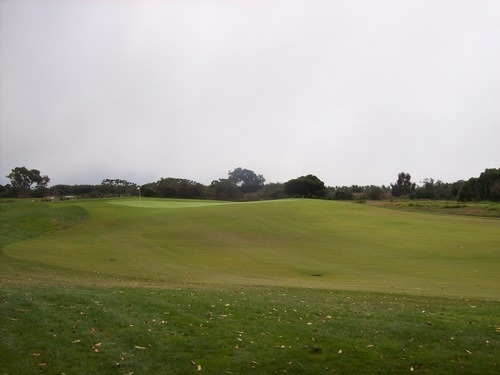 Mostly lush, but with plenty of thin/brown/bare spots mixed in where the grass is most exposed or gets the most traffic. 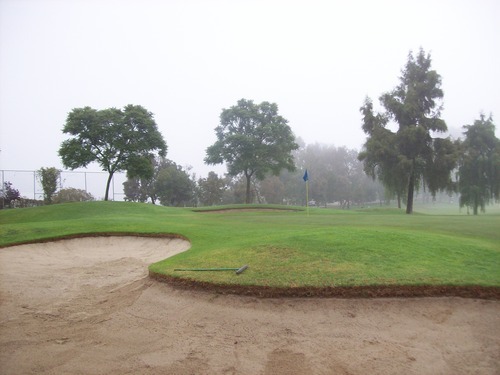 The sand in the bunkers was good and the tee boxes were mostly nice and level. 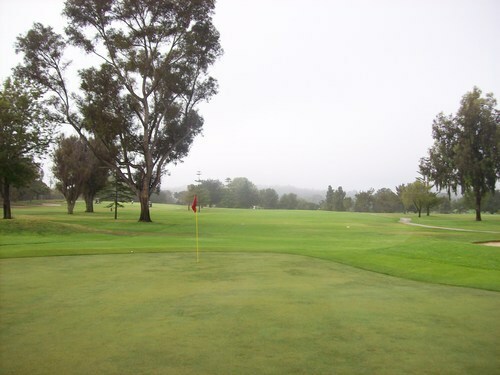 The guys I played with told me that August through October is generally the best time of year for course conditions here and overall weather in Santa Barbara. 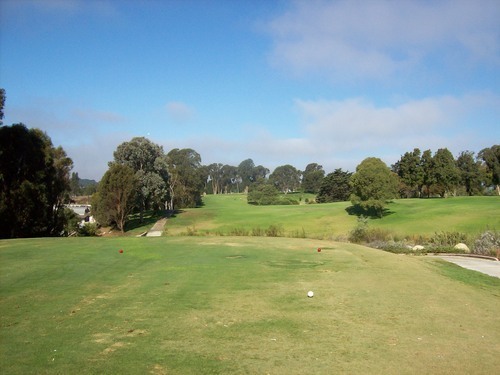 That is true with many Central Coast courses in my experience. Though I wouldn’t ever pay the full non-resident rate to play here again, I do know deals can be found. 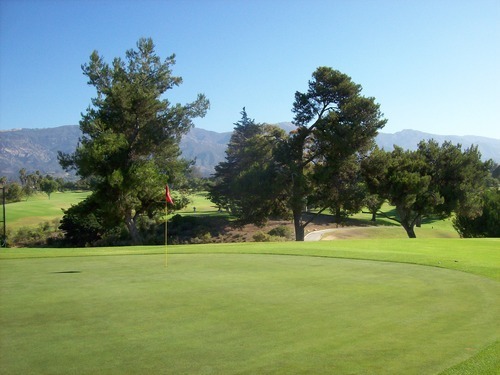 Santa Barbara Golf Club is not one you’d want to compare with the more well-known area courses like Sandpiper, Rancho San Marcos or La Purisima. However, for the right price it’s a pretty solid option and it’s much more interesting than you’d think. 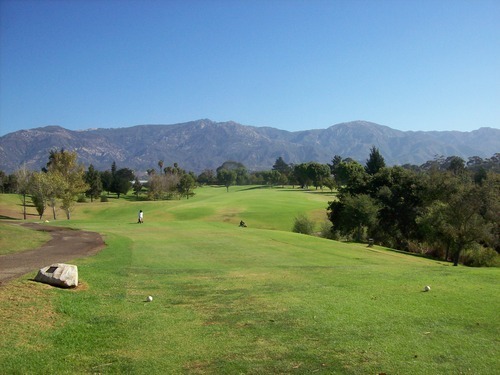 It’s always fun to tee it up with the guys from the LA Golf Group. Sunday, we played a format called Chicago where you start with a negative point “hurdle” (based on your course handicap). 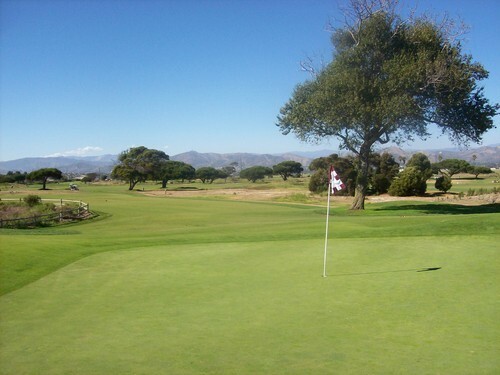 You then accrue points on the course with bogeys (1 point), pars (2 points), birdies (4 points) and eagles (8 points). The goal is to dig yourself out of your hole to overcome your hurdle and try and get to positive points. It’s not easy and only about half the group got back to even or better, but it was quite fun to play a more aggressive game. 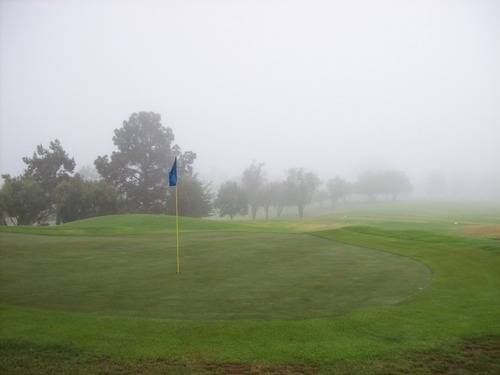 Today, I’ll just comment on current course conditions and post a few new pictures below. Olivas was in decent shape on Sunday—not the best I’ve ever seen it. 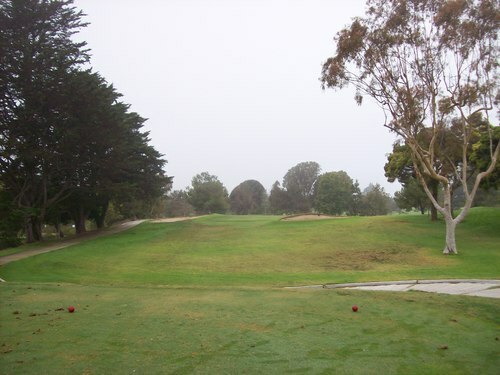 The fairways were a little more dried out. They were super firm and lies were very tight. It might not have looked quite as pretty as in previous visits, but it actually made the course more interesting. 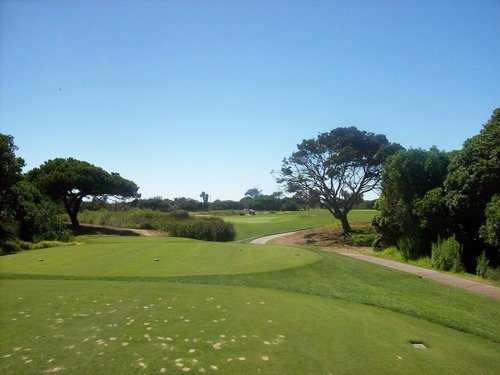 Right now, it plays like a true links layout with lots of roll-out and more trouble brought into play. 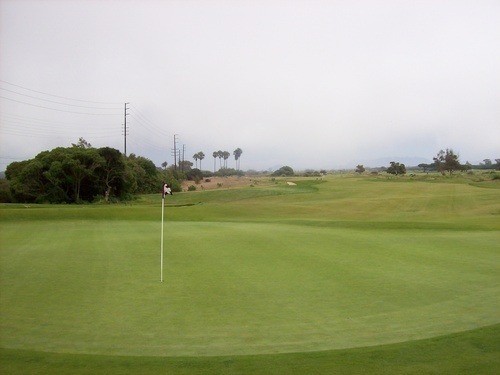 The greens were a bit bumpy in places in the late afternoon and rolling a bit slower than I’ve experienced in the past, so I was leaving many putts short. 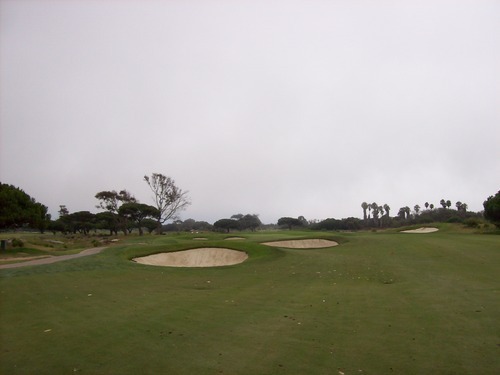 The rough was lush, but a little clumpy in the areas I found. The ball had a tendency to sit down awkwardly amongst the tufts of grass. 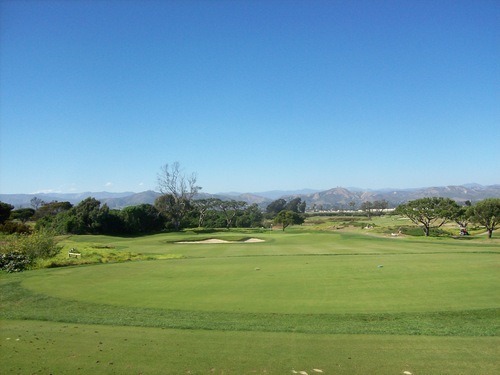 Olivas always has great twilight rates and Ventura is a nice escape from the heat during the summer months. 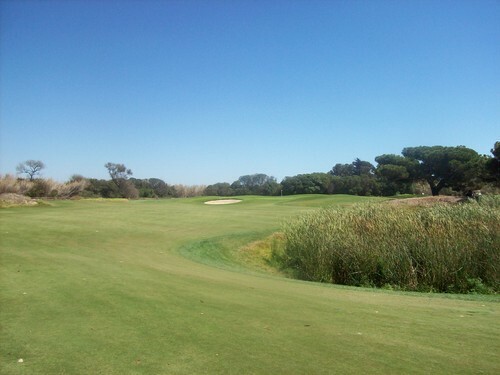 I don’t consider it to be the most dramatic or challenging layout (though the back nine does play much tougher than the relatively wide open front), but it’s usually enjoyable on all levels.